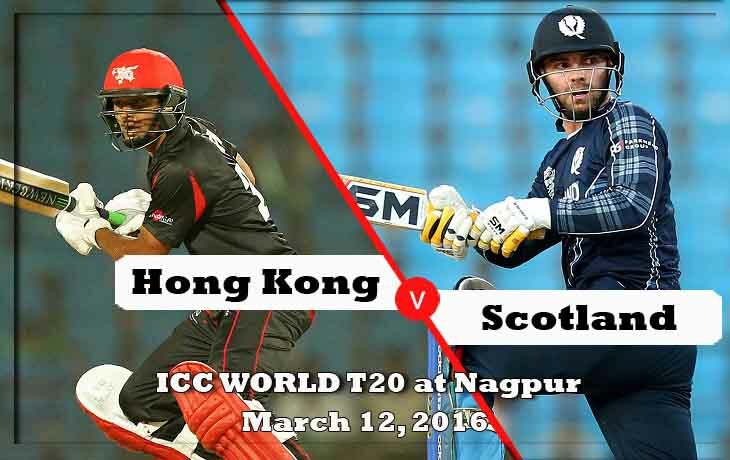 Hong Kong vs Scotland, the tenth Qualifier match of ICC World T20 2016 will start at 19:30 IST (14:00 GMT) at Vidharba Cricket Association Stadium, Nagpur, India on March 12, 2015. There is nothing to say about this match, because, both teams are lost their last two games aginst with Zimbabwe and Afghanistan respectively. In the Match 1 ICC T20 World Cup 2016: Hong Kong lost the match against with Zimbabwe by 14 runs. Though, the wicketkeeper and captain of the team tried their best for his team. Where James John Atkinson scored 53 runs with two sixes and Tanwir Afzal scored 31 runs from 17 balls with three fours and One six also, he took two wickets with good economy rates as 4.75. In the Match 6 ICC T20 World Cup 2016: Hong Kong lost the match against with Afghanistan by six wickets. Hong Kong faced the opponents balls and lost their wickets continuously after the team score as 40. But, Anshuman Rath managed the innings and scored 28 runs till the end of the 20th over. In the Match 2 ICC T20 World Cup 2016: Scotland Lost their match with Afghanistan by 14 runs. But, the team gave the highest partnership of the game. Yup..! The Openers, Kyle Coetzer(41) and George Munsey(40) are combined and scored 84 runs off 8.5 overs. Mark Watt, Josh Davey, and Alasdair Evans picked One wicket each. In the Match 5 ICC T20 World Cup 2016: The team, Scotland lost their match with Zimbabwe by 11 runs. This time, the openers failed to score on two digit runs. The middle man’s, Richie Berrington and Preston Mommsen are scored 36 and 31 respectively. Mark Watt, Safyaan Sharif, and Alasdair Evans are picked two wickets each.